With a carrying capacity of 200 kilos (30 stone) the Porta 212 is a robust semi nesting porter chair with baggage hooks, drop down arms and full width sliding footrest. has drop down arms for side transfer, a wide sliding footrest. As a semi nesting porter chair, the problem of storage in out-patients and A&E departments is alleviated by optimising space. The Porta 212 portering chair is available with additional options which are listed below and available in any colour from the Just Colour range of flame retardant vinyl fabrics. 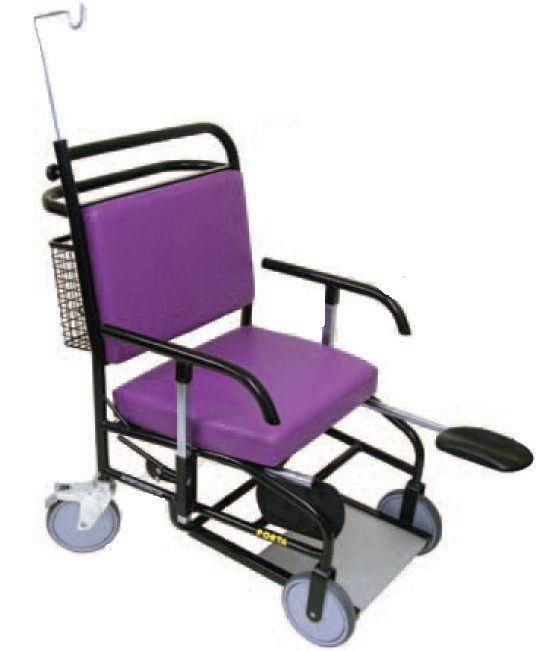 Optional fittings: Moulded Calf Supports, Basket c/w Integral Cylinder Holder and Push Handle, IV Drip Pole, Seat Belt, Chair Locking Device, Patients Note Holder.